riginally written as journal entries, Despatches is a selection from many years' travels and remembering from Michael Katakis. These writings bring the immediacy of an eyewitness report even as they convey a perceptive reflection of his own past. The deliberate spelling of "Despatches" pays homage to T. E. Lawrence, Gertrude Bell and Mungo Park, who, says Michael, "Helped a solitary little boy dream of deserts and faraway places." 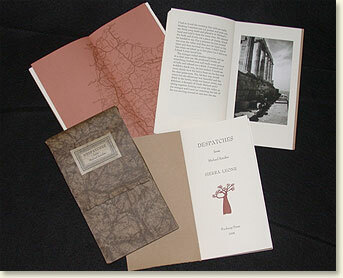 The edition is signed by the author and is limited to 185 numbered copies for sale. The price is $264 plus $6 shipping. These are not travel guides but are more personal, as if we were reading letters from the most desirable sort of friend. The friend who, though far away, carries you with him as he meanders through the medina in Fez, or strides along in the tall elephant grass of Sierra Leone. His voice is such that you can almost smell the herbs and dusty soil in Crete as you read. Mr. Katakis is the author of The Vietnam Veterans Memorial and Excavating Voices: Listening to Photographs of Native Americans. He is the editor of Sacred Trusts: Essays on Stewardship and Responsibility. His photographs appear in The Aesthetics of Action and in 75 Years of Leica Photography. "In both his letters and in his journal, Michael has an infectious ability to sense the essence of place and transmit it to the reader. Michael has two other vital qualities for a good traveler. Curiosity and a conscience. I've seen his curiosity in action. He goes up to people, says hello and asks what they're doing and where they're from. And does it with such charm and obvious good intent that soon he has friends around him like the Pied Piper had children. At the same time, he worries and he cares. Frustration, disillusion and indignation burst out of these pages, undisguised and deeply felt. He looks at himself as honestly as he looks at the rest of the world." he journal entries Foolscap Press has chosen for publication are from Sierra Leone, Morocco and Greece. We have created three separate books, each twenty-four pages in length, printed letterpress on Magnani Vergata paper and each wrapped in Camel Hahnemühle Ingres paper covers. In the center of each book is a map of that remarkable country and each set of three books contains ten photographs taken by the author and reproduced by Deborah Mills Thackrey of Willow Glen Productions. The photographs are archival pigment prints, using Epson Ultrachrome inks on 100% cotton, acid free, Velvet Fine Art paper. 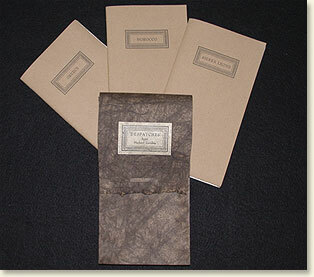 The three books slip into a "dispatch case," made of O'Malley Crackle handmade paper from Cave Paper that can be carried to an exotic location or placed within arm's reach of the would-be traveler's armchair in the library. The books measure 4.5 inches by 8 inches. 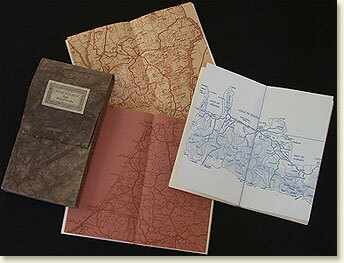 The edition is signed by the author and is limited to 185 numbered copies for sale. The price is $264.00, plus $10.00 shipping.